The two acts are in a tight race according to midweek sales figures from the Official Charts Company, with just 450 copies separating the two acts. 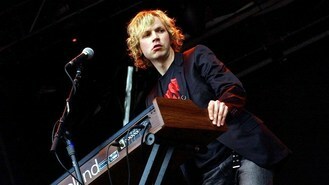 Beck, who released Morning Phase this week, has previously notched up six top 40 albums and his previous release Modern Guilt peaked at number nine. But he is only a little ahead of Bastille's Bad Blood with the group enjoyed a major boost from their success at the Brit Awards last week when they were named best British breakthrough act. The Brits are continuing to have a strong effect on sales with seven of the acts who are predicted to make the top 10 at the weekend drawn from the winners, performers or nominees on the night. And Arctic Monkeys - double winners at last Wednesday's ceremony - are in line to make it to number three, and are only 1,000 copies behind Beck with their AM album. Singer Neneh Cherry is expected to return to the album chart for the first time in 18 years with her Blank Project on target to enter the top 40 at Number 34. Pharrell Williams looks likely to go back to number one in the singles chart on Sunday with Happy - which would be the third time he has topped the chart with the song.